employment protection | Utopia – you are standing in it! New Zealand has signed and ratified dozens of International Labour Organisation Conventions dating back to 1921. They all fetter the sovereignty of New Zealand. As a member of the ILO, New Zealand is required to report on its application of ILO Conventions. That limitation on the sovereignty of New Zealand is no more and no less than in an international trade agreement. New Zealand can renounce an international trade agreement and has renounced nine International Labour Organisation conventions. The 30 chapter Trans-Pacific Partnership Agreement (TPPA) constrains domestic law and policy at central government level, and in places by local government and SOEs, in diverse areas beyond traditional aspects of international trade. …The TPP provides cumulative opportunities for foreign states and corporations to influence domestic decisions which may be burdensome and intrusive. The exact same objections apply to the ILO conventions. The union movement does not hesitate to argue that the democratic process in New Zealand should be overridden because the proposal at hand purportedly conflicts with an ILO convention. in Parliament on 4 June, the Minister was asked if he agreed with advice from officials that the ability for employers to opt out of multi-employer bargaining may breach our obligations under ILO Convention 98 on the right to organise and collective bargaining. The paper also points out that these changes open NZ up to international examination by the International Labour Organisation (ILO) for non-compliance with Convention 98 – on the Right to Organise and Collectively Bargain, which New Zealand has signed up to. Council of Trade Unions submissions to minimum wage reviews have at least a dozen references to ILO conventions and the requirement to honour their provisions. Posner and Goldsmith rightly argue that international law is a product of states pursuing their interests on the international stage. It does not induce states to comply contrary to their interests. The possibilities for what it can achieve are limited. Government sign-up to various international agreements depending on their political priorities. You cannot complain that governments that you did not vote do what government you voted for also did, which was sign up to international agreements that suited their political agendas. The solution is to work harder to win the next general election. As for opposing trade agreements on sovereignty grounds, it is rank hypocrisy for the union movement to do so given the number of times it cites international labour agreements when it suits them and seeks their inclusion in trade agreements to raise labour costs in developing countries. This entry was posted in constitutional political economy, economics of regulation, international economic law, international economics, International law, labour economics, law and economics, politics - New Zealand, unions and tagged employment law, employment protection, employment regulation, ILO, labour market regulation, social clauses, TPPA on February 4, 2016 by Jim Rose. 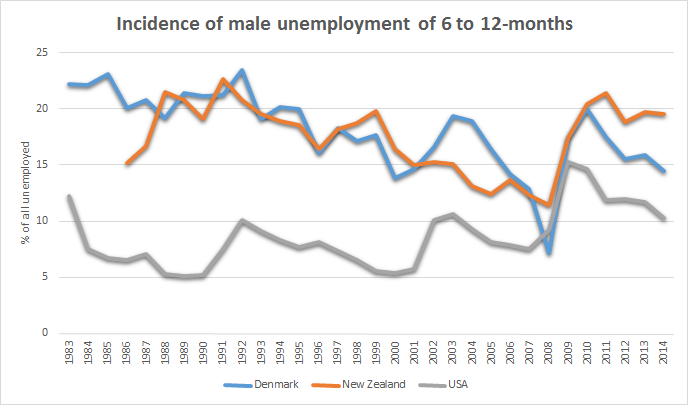 My search for an example of how Danish flexicurity might have an advantage over the status quo in the New Zealand labour market is still to yield results. 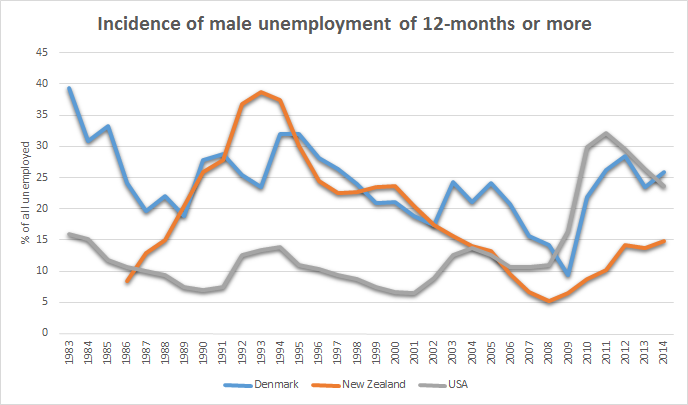 Danish flexicurity is no better than New Zealand and often worse in keeping long-term male unemployment rates down as the charts below show. The flexicurity model combines flexible hiring and firing with a generous social safety net and an extensive system of activation policies for the unemployed. Data extracted on 18 Jan 2016 21:55 UTC (GMT) from OECD.Stat. The charts above and below do show is that a more generous social safety net for the unemployed introduced with the onset of the Great Recession in the USA was followed by a sharp increase in the incidence of long-term unemployment. This entry was posted in Euro crisis, great recession, job search and matching, labour economics, macroeconomics, politics - New Zealand, politics - USA, unemployment and tagged Denmark, employment law, employment protection, flexicurity, labour market regulation, social insurance, welfare state on January 19, 2016 by Jim Rose. 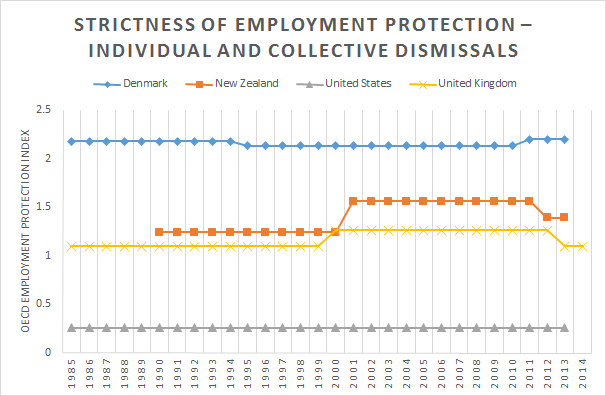 Denmark is all the go in the New Zealand Labour Party as a model for labour market flexibility despite the fact that it is much more heavily regulated than either New Zealand or the USA. 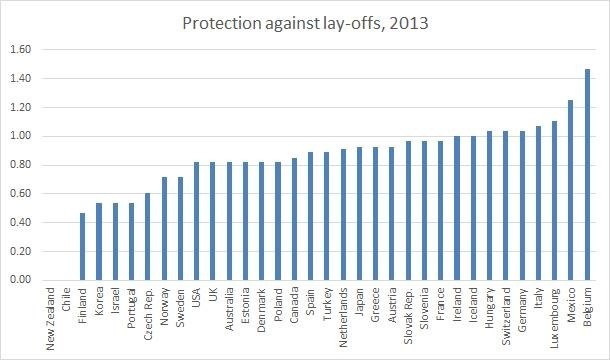 Source: OECD Indicators of Employment Protection – OECD. This entry was posted in job search and matching, labour economics, politics - New Zealand, politics - USA and tagged Denmark, employment law, employment protection, labour market regulation on January 18, 2016 by Jim Rose. The chart below shows that New Zealand is far more flexible than Western Europe and is pretty near the USA in terms of people moving in and out of the unemployment pool every month with great ease. There are very high outflow rates from unemployment among the Anglo-Saxon and Nordic economies. The economies of Continental Europe stand in stark contrast. Unemployment outflow rates in these economies lie below 10% at a monthly frequency. Source: Unemployment Dynamics in the OECD, Elsby, Hobijn and Şahin (2013). This entry was posted in economics of regulation, labour economics, law and economics, politics - Australia, politics - New Zealand, politics - USA, unemployment and tagged employment law, employment protection, labour market dynamics, labour market regulation on December 15, 2014 by Jim Rose. 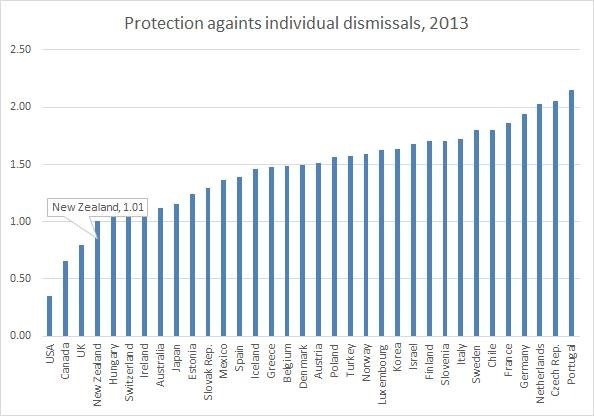 The first chart below shows that NZ is the 4th most deregulated labour market for individual dismissals. The next figure below shows that NZ is top of the world for deregulation of lay-offs and redundancies. The chart below shows that New Zealand is far more flexible than in Western Europe and is pretty near the USA in terms of people moving in and out of the unemployment pool every month with great ease. Source: Elsby, Hobijn and Şahin (2013). 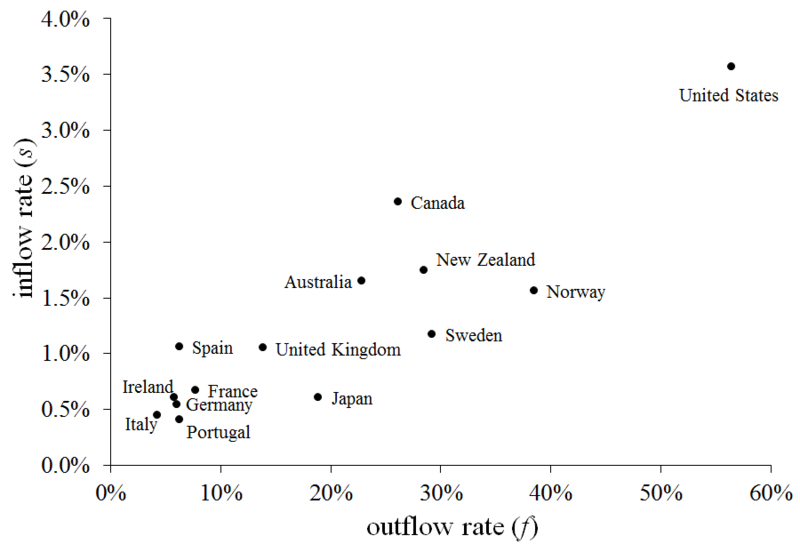 There are very high outflow rates from unemployment among the Anglo-Saxon and Nordic economies. The economies of Continental Europe stand in stark contrast. Unemployment outflow rates in these economies lie below 10% at a monthly frequency. A major labour market reform in recent years in New Zealand was introduction of the option of a 90 day trial for new employees, initially in small businesses and then in all businesses. The UK recently extended its trial period from one-year to two-years. Trial periods are common in OECD member countries. · Academic productivity declining after winning tenure. The MBIE research into the actual operation of 90-day trials was highly favourable in terms of increased employment, the hiring of riskier applicants and lower costs of ending bad job matches (about 15-20% of trials did not work out). These outcomes are the usual importance of a test drive argument for employment trial periods. Interestingly, the MBIE research also found that some employers hired new employees on 90-day trials for positions about which these employers were uncertain might be profitable. But for the option of the trial period, these jobs never would have existed. This suggests that in some firms, 90-day trials are a decisively cheaper alternative to hiring an employee and perhaps making them redundant later if the new position does not pay for itself. No one’s fault: the market just did not sustain the expansion in staff as expected. The MBIE research shows that winners from 90-day trials are new labour force entrants, the unemployed and beneficiaries, migrants and labour force re-entrants such as mothers. I kept note of an interesting press report adding to this where Hospitality New Zealand Wellington president Jeremy Smith said he had hired dozens of staff he would not otherwise have considered. Because of the transient nature of the hospitality industry, it was often difficult to check references so a trial period “levelled the playing field”. This entry was posted in economics of regulation, labour economics, politics - New Zealand, unemployment, welfare reform and tagged 90 day trials, employment law, employment probation periods, employment protection, labour market regulation on July 31, 2014 by Jim Rose.